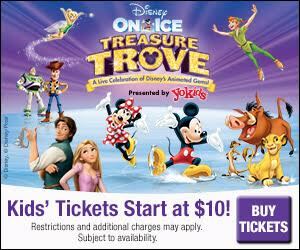 Disney On Ice is coming to town again, this time with Treasure Trove. There will be endless riches with an extraordinary lineup of stories from the Disney Vault. It all comes to life in the ultimate Disney animation celebration. Join in on the fun filled treasure hunt with Mickey Mouse, Minnie Mouse, Donald, and Goofy. Get tangled up with Rapunzel and Flynn, enter the worlds of many other favorite Disney Princesses like Ariel, Belle, Cinderella, Jasmine, Aurora, Tiana, Mulan, and Snow White. Set sail with Peter Pan and Tinker Bell along with Captain Hook and is pirate Pals. Trek the wilds of Africa with Simba, Nala, Pumbaa and Timon as they discover the true meaning of the 'Circle of Life.' Tick-Tock! Tick-Tock! Don't be late to a very important date with Alice and the Mad Hatter as they march with the Queen of Hearts' Army of Cards, plus set a playdate with Woody and Buzz Lightyear. This show will highlight eight Disney movies and more than 50 Disney characters. This show is sure to have something for everyone. or in-person at the venue Box Office. o If someone purchases more after 4 then it is 25% off. o How the deal works is basically 4 tickets purchases at 25% off, which makes one ticket 100% off… make sense? We just word it as Buy 3 Get 1 Free. The Encore Agency will be providing my family with tickets to the show in exchange for posting about the show.